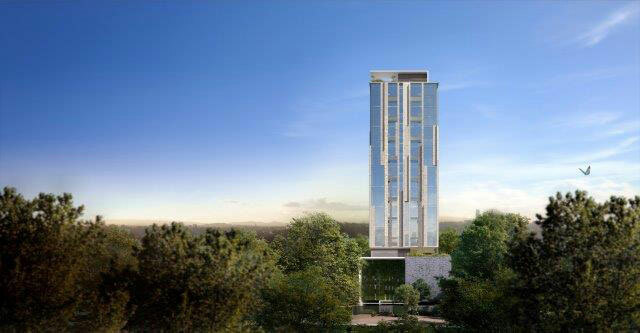 Under development by Ekco Investments, a collaboration between Design Source Ltd, an architecture and Interior Design Firm in Kenya, and Paragon Architects of South Africa are overseeing Habitat Apartments in Kilimani, a 24-storey, 112-unit mixed-use apartment tower. “When the client first approached us they were clear that they wanted a world class building, in which we had no doubt in our minds who to work with on this project and that is how the collaboration with Paragon came about”, explains Chris Naicca, Director at Design Source Ltd. There is a sense of an almost overbearing indulgence, mixed used apartments predominantly residential from studio apartments to three-bedroom duplex units, exploring the same level of spatial discipline as the largest penthouse at the very top. The scheme affords an integrity of spatial design that only reinforces how apartment living in Nairobi should be explored, simple and un-patronising, but is a conscious effort at reinterpreting the Kenyan aspiration of modernity within the wider context of Africa. The project is, in turn, an attempt to bring architecture in Africa to the world stage. Design Brief “The design brief was for a tall building that maximized the development potential, while containing excavation and foundation costs. At first, the project was envisaged as a long-stay apartment-hotel.” explains Paragon Founding Director Henning Rasmuss, who attended the official site-handover ceremony on 8 November 2017. The building’s verticality has been emphasized in the planning and massing through a series of linear signatures on the façade, multiply occurring on lighting fins, façade openings and an overall perforated concept to the building that fades as the building rises. It is doubly intricate, as these patterns have been explored as part of the identity of the client team as a whole, from the podium’s blue stone, to the cladding that hints at a modern take on the scheme. Habitat Apartments “rethinks the concept of a vertical village” in a site that straddles the upper-hill of Nairobi. “The idea was to be as efficient as possible, and afford the city perhaps its first vertically-articulated building,” Paragon Architect’s Edwin Seda comments. The perforations borrow their idea from a need to give the building an identity that ties back to the client, with the exploration of the DNA strand explored as dots that represent the client’s team, which in turn has been abstracted into these perforations. The multi-functional duality here is that these screen abstract the identity of a modern African ‘habitat’, but still act as light wells and harbors for controlled views and extravagant ambiance. “The location of the project inspired the type of design. The site is within Upper hill area of Nairobi which is a very strategic location. The buildings of similar height in Upper-hill are all commercial. We had to come up with a look and feel that can fit in with the commercial buildings yet carry the different function of being serviced apartments. The ambition of the client to have a world class building also inspired the design to take on the look and feel that we have achieved”, explains Hudson Ng’ang’a from Design Source. Exterior The main raw material used, Nairobi blue stone, added an element of ‘cubic permeance’ to the scheme. The brise-soleile articulation of the stone took a simple material and advanced it a step further in how traditional materials are used in the modern age. “This is especially important as an aspect of identity, and to reduce the carbon footprint,” Seda notes. The brise-soleile articulates the podium and shapes the building, while at the same time shading the parking structure and allowing these spaces to ‘breathe’. The total green area – comprising planted sections vertically across the building – accounts for 30% of the site, including the landscaped street interface, the planted podium on the entertainment level, and the rooftop entertainment level gardens, which comprise 430 m2 of the 1 400 m2 site. With roof gardens, cubic permanence in the podium and tower, and an overlay of different scales to the façade, the scheme has been grounded in the city with little victories here and there that come together and allow the scheme a vibrant contact with the street, neighborhood, and the city as an extended canvas. “This was important in ensuring a somewhat ‘giving back the green’ approach. Taking the planted screen into consideration, the ratio almost balances out at a 50/50 percentage of building coverage to site greening,” Seda reveals. Lighting was also a key element. The striped façade introduced a new multiple identity, with each floor transitioning seamlessly into the next. The intimate balconies, tucked away from the streets as somewhat internal amenities, are really just nooks that spill out from the internal spaces, and are terminated only by the façade, which stops short to stagger the planes vertically. Challenges Faced “We have had challenges with the size of the site and the nature of the site. During excavation we encountered a portion of the site that had some hard rock not previously picked up by the Geotechnical surveys, but we worked with the engineers and the excavations contractor quite well to manage issues relating to cost and time. The size of the property was also a challenge as it minimized the frontage that we have for the building with regard to its relationship with the street but we have managed to create wonderful visual interaction with the overall perforated concept being applied even at street level”, concludes Hudson. The project is scheduled for completion by mid-2020. More of these kinds of projects will undoubtedly take a tinny bite off the spiraling congestion problems that have become a choke-hold on Nairobi’s economic advancement. I would love to explore on the possibility of living in the ‘historic’ building. Please provide more purchase information. This is incredible and absolutely wonderful. We are specialist material suppliers to the Construction Industry in South Africa. We would like to enquire what opportunity there could be to supply material to the project at cost effective pricing. We look forward to your advise.